Man, I love being a food blogger! Let’s find out what exactly is in this package. First up, is the new Nespresso Inissia coffee machine. This cute little machine is so tiny and looks quite classy on my kitchen counter. The machine comes with the Aeroccino 3, which you’ll need to use separately (it does not connect to the Inissia). I love the Aeroccino – it makes perfect frothy milk and can give it to you either hot or cold, and with or without froth. Also in the package is the Ritual Cappuccino Kit. I haven’t opened this box yet as I haven’t yet devised a recipe to use it with. Now for the box with all the details and food pics – this one holds the ingredients! But before I opened this box, I had a look at all the photos. Beautiful photos from Cook Republic, A Table For Two, Wholesome Cook, and many more adorned the box, but guess who else’s photo features? That’s right, yours truly! Remember when I had only a couple of days to come up with a brownie recipe featuring Nespresso’s Cioccorosso? That was a lot of fun and I was very happy with the recipe I came up with, which was a gooey chocolate brownie which was infused with Cioccorosso and studded with chocolate chunks and fresh raspberries, then frosted with Cioccorosso ganache and fresh raspberries. 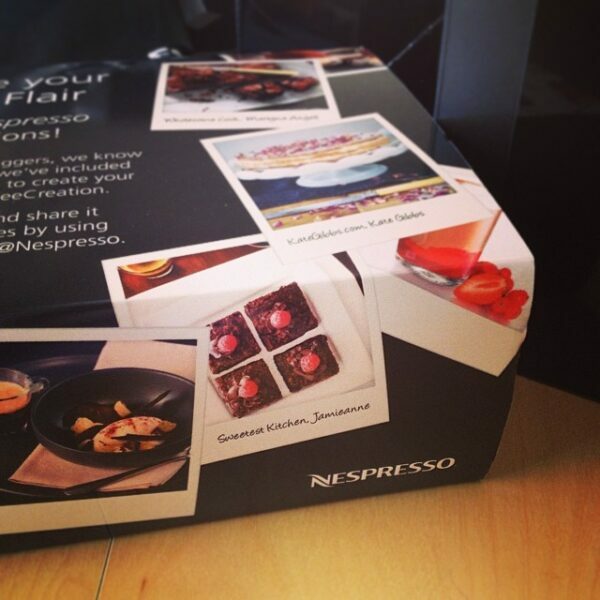 Inside the box was a sleeve of Nespresso’s limited edition Colombian Grand Crus, Santander and Cauca. Santander is a balanced and round coffee with hints of toasted bread and caramel, while Cauca, is a slightly less intense, yet complex and aromatic coffee with notes of ripe fresh fruit. Also in the box was cornflour, coconut milk and cinnamon sticks along with a recipe and photo for alfajores. Oh, and also included was a black Nespresso apron! So the details are basically to create a Colombian-inspired recipe using the new Grand Crus. I’ve had a bit of trouble with this one and tried out three previous recipes that I ended up not being very happy with. Then I had some ideas that featured the coffee, but didn’t really have anything to do with South America at all. Then finally, I got it. Alfajore ice cream. 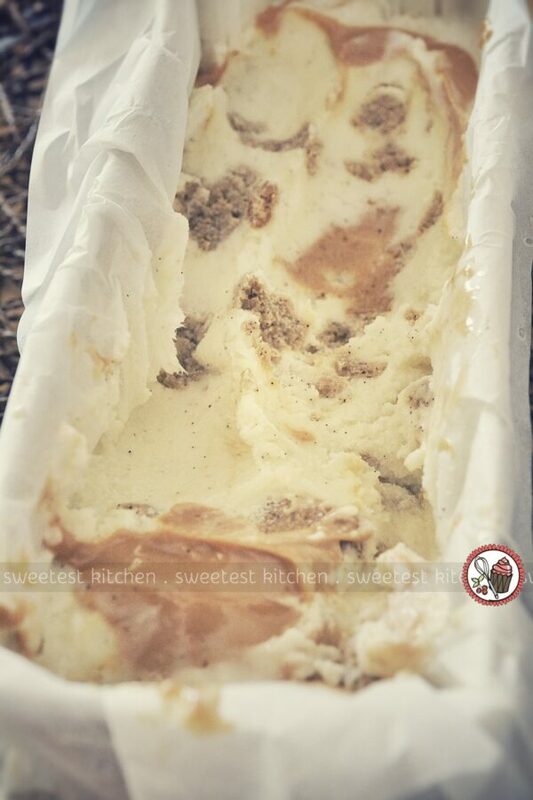 Vanilla ice cream (which in reality is a gelato) with chunks of Santander-infused alfajore biscuits and swirls of dulce de leche. The big trick here was getting the flavor of the coffee into the biscuits. I knew from experience that just pouring in a bit of espresso wasn’t going to give a very strong coffee flavor, so I used the actual coffee grounds from the capsule for a big coffee hit. The black specks you see in the ice cream are real vanilla seeds, and the black specks you see in the biscuits are the ground coffee bits. Don’t worry, it’s not gritty! The ground coffee is actually very fine. Putting all this together is quite easy, although if you’re pressed for time, you may need to start a day ahead. 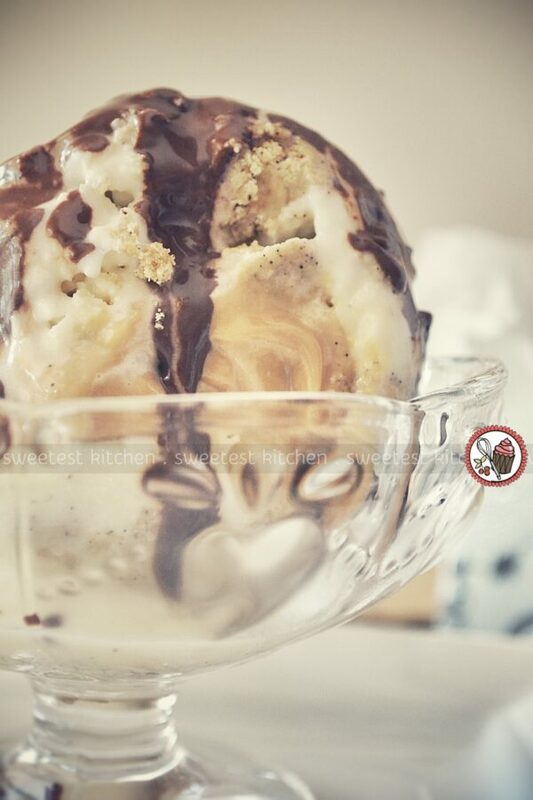 The ice cream base can be made a day ahead and refrigerated overnight before churning in your ice cream maker. The biscuits can also be made a day ahead. I’ve also provided some simpler variations in the recipe notes below. The flavors all work well together, and while the biscuits aren’t overly sweet with such a big hit of coffee (feel free to add a little more sugar to the biscuit dough if you like things sweeter), they taste like you’re eating a real coffee bean! The biscuits do soften up in the ice cream, but still provide a bit of texture. I had a jar of mocha sauce left over from a previous recipe I had tried with a capsule of Cauca, so I figured, why not!? A great addition, if I do say so myself! The mocha sauce is simply a mixture of dark chocolate, espresso and cream. It’s really dreamy, and if you do have the time to make it, please do. It’ll taste great on so many things! Cheesecakes, pancakes, puddings, you name it. 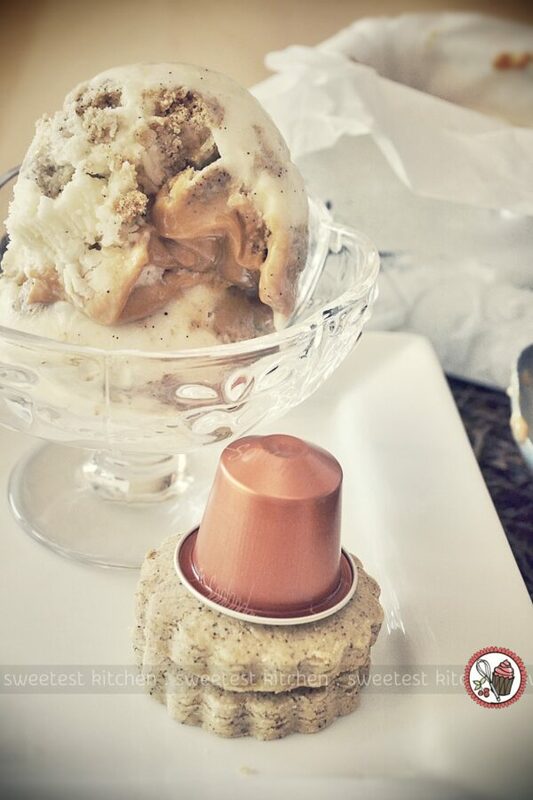 So, if you’d like to get creative with your Nespresso capsules, this espresso alfajore ice cream is a great way to start! Enjoy! By the way, I know the “antique”-look isn’t something I normally do to my photos here, but I really liked the vintage coffee color and thought it enhanced the mood of the photos. 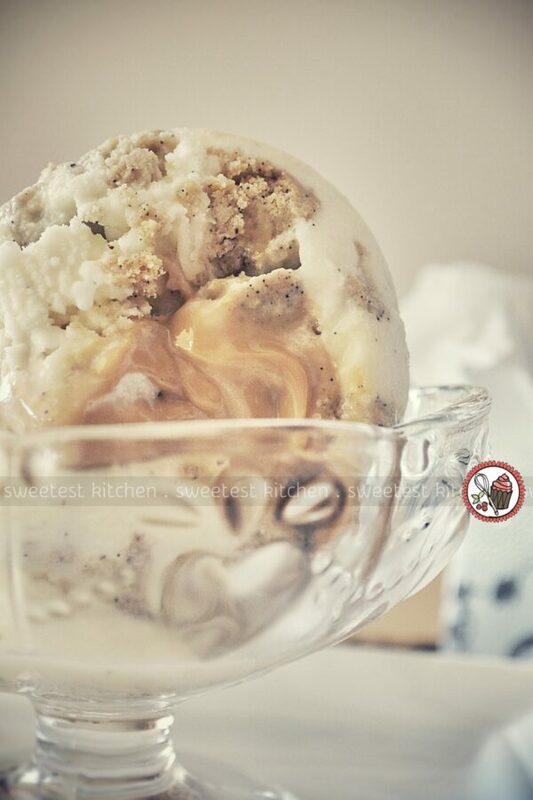 A vanilla bean ice cream with chunks of espresso-infused shortbread biscuits and swirls of dulce de leche. Featuring Nespresso's limited edition 100% Colombian Grand Crus, Santander and Cauca. For the shortbread biscuits, whisk the flours, baking powder, baking soda and salt together in a medium bowl and set aside. Place butter, sugar and the contents of the Santander capsule in the bowl of a stand mixer fitted with the paddle attachment. Mix on medium speed for about 3 minutes, until fluffy, scraping down the bowl as needed. Add egg yolks and vanilla and mix until incorporated. Scrape down the side of the bowl. On low speed, gradually add the flour mixture and mix until just incorporated and no bits of the flour can be seen. Turn the dough out onto a piece of plastic wrap, shape into a disc and wrap tightly. Refrigerate for 1 hour, or until firm. Preheat the oven to 350F (180C) and line two trays with baking paper. Remove the dough from the refrigerator, unwrap it and place on a lightly floured surface. Lightly flour the top of the dough. Roll out to 6mm (1/4-inch) thickness (if the dough cracks, just patch it back together). Cut out 24 5cm (2-inch) rounds, re-rolling the dough as necessary. Place the biscuits on the prepared tray and bake for 12 minutes, or until firm and lightly golden on the sides and bottoms. Cool completely. For the optional mocha sauce, combine all three ingredients in a heatproof bowl over a pan of simmering water and heat until smooth, stirring often. Store in the refrigerator until ready to serve. Can be easily re-warmed gently in the microwave. For the ice cream, combine milk and cream in a small saucepan and heat gently until it starts to boil, stirring often. Meanwhile, split the vanilla beans lengthways with a small, sharp knife, scrape out the seeds and add them to the milk and cream, along with the empty vanilla beans. Stir, then transfer the mixture to a heatproof bowl, cover with a cartouche to keep a skin from forming on the surface, and refrigerate for 20 minutes. Meanwhile, in a large mixing bowl, beat the sugar and egg white with an electric whisk or beaters until soft peaks form when the beaters are lifted out of the mixer (note that I didn't ever get "peaks" at all, but the mixture fell in ribbons from the beaters and I was in too much of a hurry to continue beating it!). Pour in the chilled milk mixture, being sure to remove the vanilla beans, and beat for another 20 seconds. Transfer the mixture to an ice cream maker and churn according to manufacturer's instructions. To assemble, take about 7 shortbread biscuits and break them into bite-sized chunks as the ice cream is churning. When the ice cream is done, quickly and gently stir in the biscuit chunks. Pour a layer of the ice cream into a freezer-safe container. 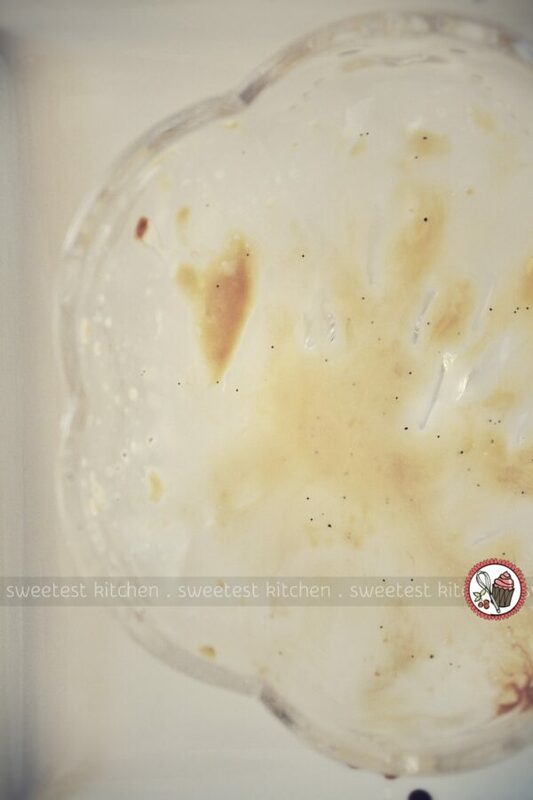 Smooth the surface and spoon half of the dulce de leche over this layer. Swirl the dulce de leche with a skewer or butter knife. Repeat this layer with the remaining ice cream and dulce de leche. Cover and freeze for at least 4 hours. Can be stored in the freezer for 3-4 days. - to make the process a bit simpler, use good-quality store-bought vanilla ice cream; just soften it a bit to stir through the biscuits and layer it easily. - if you don't like coffee, simply omit the coffee from the biscuit recipe; you can also use store-bought shortbread biscuits. - you can use Nestle Top 'n Fill if you can't find dulce de leche; just dump it out into a bowl and give it a good whisk to eliminate the chunks. * Biscuit recipe adapted from Chow. * Ice cream adapted from Gelato. OMG, looks AMAZING! Can’t wait to give this recipe a go!